African migrants chant slogans during a protest in Rabin Square in Tel Aviv, Israel. On Sunday, Feb. 4, 2018, Israeli authorities began distributing deportation notices to thousands of African migrants saying the migrants have 60 days to accept the offer to leave the country for an unnamed African destination in exchange for $3,500 and a plane ticket. Those who don't by Apr. 1 will be incarcerated indefinitely. JERUSALEM (AP) — Israeli authorities have begun distributing deportation notices to thousands of African migrants. In letters delivered Sunday, Israel says the migrants have 60 days to accept the offer to leave the country for an unnamed African destination in exchange for $3,500 and a plane ticket. Those who don't by Apr. 1 will be incarcerated indefinitely. 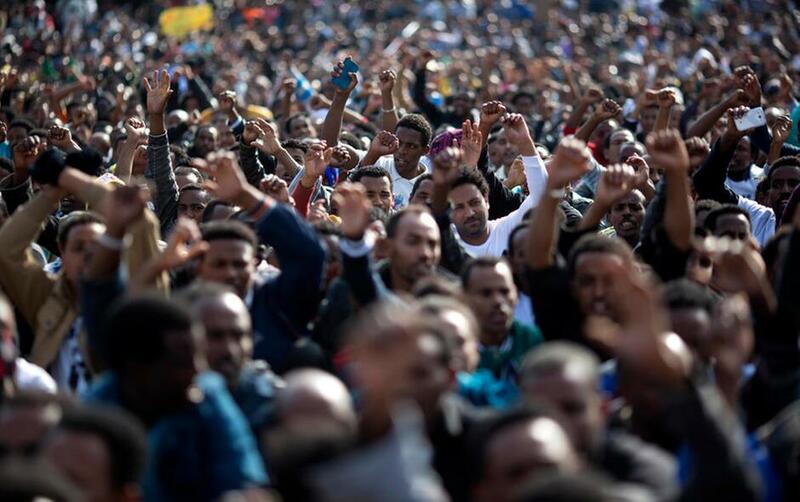 Some 40,000 migrants, nearly all from Eritrea and Sudan, fled danger for the safety and opportunities of Israel in recent years. Many have expressed fear of being sent to Rwanda, their likely destination. The deportation plan has sparked outrage in Israel, where groups of pilots, doctors, writers, rabbis and Holocaust survivors have appealed to have it halted. They say the deportations are unethical and would damage Israel's image as a refuge for Jewish migrants.